I hope this letter finds you in time to wish you all a very happy and blessed Christmas. 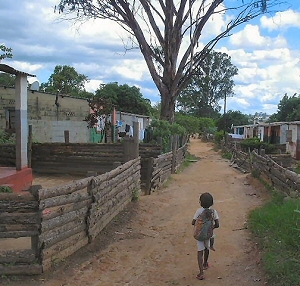 Mindolo is a quiet place now, the students have returned home, as have many of the volunteers who came during the past year. Although some of us have Christmas decorations, there are no thoughts of snow in Mindolo! The weather is hot and there are frequent violent thunderstorms, which I am told are made stronger by the copper deposits in the ground. Thankfully they have not caused any major power cuts this year, and the waterproofing Adrian did on the roofs in Ipusukilo seems to be holding. Thanks Adrian! Both Richard and Samuel have finished their grade 12 exams and are waiting for their results, which should come around February / March 2009. Richard wants to go to University and is investigating a bursary, but the system is such that, even if he does get funding, he would not be able to start till January 2010. With high unemployment and rocketing food prices, ( The price of a 25kg bag of maize meal is now 75,000 Kwacha - double that of this time last year) I have been encouraging the boys to put together a survival plan. A few months ago Samuel got a loan to buy cooking oil in bulk, which he sells on the street in small packets. He has now diversified into salt, rice and a few other staples. He is hoping that now school is over, he will be able to direct all his attention to the shop (which is little more than a stall in the street). Richard too, is looking at starting a shop. He already has a small kiosk near his house and has costed the price of a starter pack, and he is hoping to have everything in place before Christmas. Having been orphaned at such an early age has taken its toll on these young men. Richard has the added responsibility of five other mouths to feed as well, so please pray that their income generation ideas will be successful. 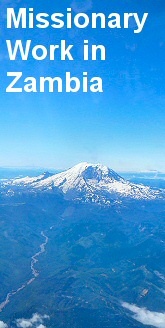 I think I have spoken before of the extraordinary generosity that some Zambians have. One such person is Caroline, a 24 year old mother of two who looks after eight other children who have been orphaned and / or cruelly treated. Caroline reached grade 12 and is also putting her talents to good use by schooling about 20 children in her back yard. When she can afford she will give them a little porridge as well, but as you can imagine her husbands taxi drivers wages are not wonderful. I had a visit from her recently with two of her young charges ( who I noticed were sharing a pair of shoes!) She had come on another errand, but over a cup of tea told me she had been laid low with malaria recently, and that she had also attended two funerals. A cousin, and Crispin’s grandmother. Gran had died unexpectedly, leaving 15 dependant children between the ages of seven and eighteen. Crispin’s grandmother had eight children of her own, only two of whom are surviving. All the others Accompanying Caroline on the road to the market and their spouses are dead and their children were distributed throughout the family, the bulk of the burden falling on grandma. We discussed their circumstances. They live in a small isolated two bed roomed farmhouse about thirty miles away. They were described as hard working, taking after their grandmother, who was as resourceful as she was generous. She had an arrangement where she used to siphon (illegally) diesel from trucks and sell it on to the locals, these “earnings” supplemented what ever they could grow on the farm. (which is just a few acres I think). Now the grandchildren are alone. There is no room for them with other family members, (Caroline manages to keep twelve in only two rooms). 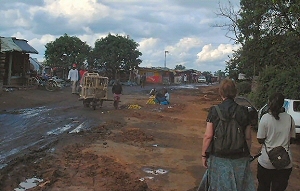 In the Zambian tradition, most of the food on the farm had gone to feed the mourners at the funeral. She had been distracted with worry over what was going to happen to them, but thankfully her prayers for these desperate children had been heard. There was an unexpected gift - enough to keep them in food for a few weeks, and to buy some seeds for planting. I was also able to give her an address where she might find more assistance. Truly, I am grateful that the God of the poor chose to be born in a stable, accepting gifts off the poor as well as the rich, and living His youth in uncertainty and exile. It is a joy to know that we do not just have a God who cares, but one who understands and remembers too. May the Grace of Christmas touch each one of us as we give thanks for Gods greatest gift this year, Oh, and by the way, I gave Caroline an old pair of sandals so at least the girls did not have to hobble home in the rain.